It’s hard imagine a pub/festival/café/market menu without pulled pork appearing somewhere. Whether served on its own, drowning in (often sadly generic) BBQ sauce, piled on a burger, folded into a pasty (yes really), or chucked onto a pizza, the true wonder of this stalwart of American BBQ has become a sadly abused dish that deserves a bit of attention and re-vitalisation. I am in no way trying to re-invent this truly wondrous piece of cooking, merely trying to show how bringing it back to basics can elevate it to its deserved place atop the meaty heights of glory. And the best thing is that you can do this recipe at home in your oven (although arguably it would be even better if you did it in a smoker) with minimum fuss. It really is a case of having faith in the low and slow school of cooking and just leaving it alone until it is done – that can be anything from 8-18 hours depending on oven temperature and how big the piece of pork is. I would highly recommend getting a meat thermometer for this and, if you can, get one with a remote probe that you can leave in the oven and thus preventing the need to keep getting the pork out to check. This recipe is pretty much as laid out by the excellent Felicity Cloake and all I’ve done is lowered the temperature slightly and tweaked the rub. I would highly advocate using bone-in shoulder of pork for this with the rind still on. The bone will add flavour and the rind and fat will help keep the meat lubricated as it cooks and slowly breaks down into melting, tender piggy joy. Once shredded the pork also needs to sit for a while (preferably overnight) in the fridge with the juices so make sure you plan ahead for the time. 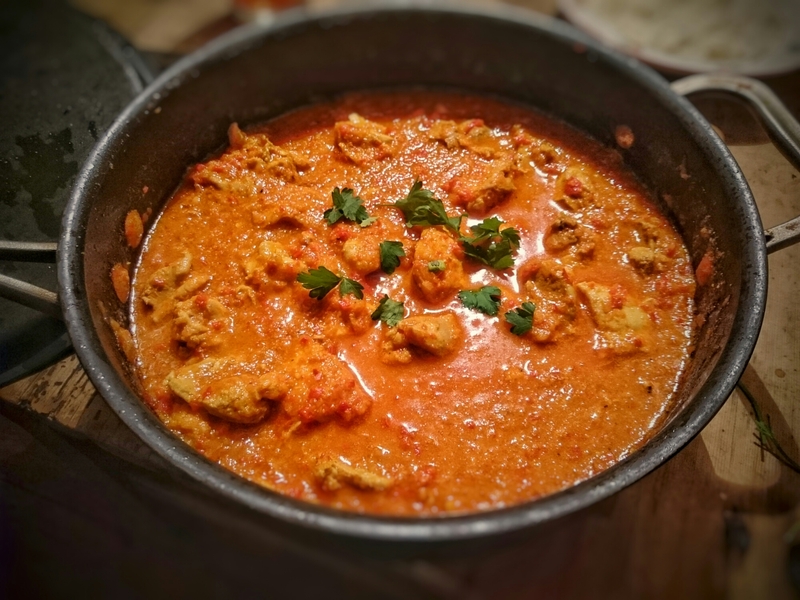 This version of the recipe will easily feed 20 people – if you are using a smaller piece of shoulder then simply reduce the rub quantities and cooking time (a 2kg piece should be done after 6-8 hours) and keep an eye on that internal temperature…. Score the rind with a sharp blade (or get your butcher to do it for you) so the rub can wiggle its way through – a criss-cross or just lines, it’s up to you. Mix together the salt, sugar, paprika, and black pepper and rub about half of it on to the pork. Really work it in and cover the whole shoulder with it. Put the pork in a roasting tin (you will need a big one) and place in the oven, letting it sizzle and crackle for 30-40 mins. Take the pork out and turn the oven down to 110c/Gas Mark ¼, stick in your remote thermometer (if you have one) and cover the vast slab of pig with a tent of foil to keep the moisture in. Don’t wrap it tightly as you want the humid air to circulate a bit. Put the pork back in your low oven and leave well alone for anything from 12 to 18 hours. The pork is ready for pulling when the internal temp is between 85 and 89 centigrade – be patient! The wait is worth it. If you haven’t got a remote thermometer, check the pork after 8 or so hours and keep cooking as needed – try to keep taking it out of the oven to check the temperature down to a minimum as it will only slow things down. When your thermometer reaches the longed for temperature (your kitchen and probably entire house will probably be full of porky aroma), take the pork out, remove the tent of foil and then turn the oven back up to 200c/Gas Mark 6. Drain off the juices (there will be a lot) into a jug or bowl and set aside. Put the meat back in for 10 mins or so to firm it slightly then remove and leave to rest, covered again with a tent of foil, for half an hour. It should practically escaping from the bone by this time. Using a couple of sturdy forks, shred the pork into ribbons and chunks, skin and all. The bones should slide out clean but give them a scrape if reluctant meat is clinging to them. Once you have shredded the meat, mix in the rest of the rub and then return the juices to the meat and stir it all together. It will smell epic. Leave to cool then cover and place in the fridge to mingle and mix – overnight if you can. When you are ready to eat, remove from the fridge and reheat in a moderate oven. If you are serving this as part of a buffet or party, you can always leave the pork in a slow cooker to keep warm. Grab a bun and slice it in half, put a goodly dollop of your favourite coleslaw on the bottom, pile a huge mound of sticky, glorious pork on top, squirt on some quality sauce, and put the top on. Eat instantly and expect to be liberally covered juice and sauce. Then sneakily reach for another bun and repeat. You know it makes sense! A friend recently told me that she loved eating beef but she’d never cooked it. I asked her why and she really didn’t know – by all accounts she is an experienced and accomplished cook so this did seem rather odd. I showed her a picture of a rib of beef I’d cooked for my birthday and she asked how long I cooked it for, looking slightly surprised at the short cooking time and saying she wasn’t sure if she’d be brave enough to tackle something like roast beef as surely it was quite complicated. There are lots of people who think a large roast is a complicated thing but really, it’s all down to planning and organisation and, more often than not, it’s all the accompanying dishes that cause the headaches. Unless you’ve got a fantastically complex meal in mind, roast meats (and beef in particular) are pretty easy to get right and a simple but delicious hunk of meat is always going to please. Obviously if you are vegetarian or vegan you will massively disagree with me but there it is. For me, the quality of meat is a defining factor and, put simply, the higher quality meat then the better the finished dish. I insist on free range, high welfare meat as not only to do I think this is morally the only choice, but there is no comparison when it comes to quality of flavour. Buy the best you can afford – it will be worth it, trust me. As for timing, I always follow the blast-then-low method (which I learned from, the ever-dependable Hugh Fearnley-Whittingstall) – where the oven is preheated to its highest setting and the meat gets a good 20mins or so to start the cooking process. The temperature is then reduced for the rest of the cooking time and the results are always spot on. You can adjust how long the lower temperature cooking is depending on how you like your meat cooked – I insist on rare for beef and lamb but I will give you times for medium too. Well-done is simply unacceptable in my opinion and doesn’t bear thinking about. Also, the resting time is vital – if you try and carve meat straight from the oven you will not get the best results. Meat needs to relax after cooking, to let the juices sink back in – in short, to rest is best! Also if you’ve slightly under-done it, your roast will continue to cook slightly as it rests which can be a big help. I rest meat for a minimum of 30 minutes but longer is fine – just don’t cover the joint too tightly with foil or there is a risk the residual heat may overdo your carefully timed roast. I always have beef with Yorkshire pudding, roast potatoes, greens, gravy and hot horseradish sauce but you can have whatever you prefer. But if you are one of those strange people who has cauliflower cheese with a roast dinner I’d rather not know about it. This quantity will feed 6-8 depending on how greedy you are. Just don’t have cauliflower cheese with it…. It may seem odd to be reviewing a recipe but sometimes a dish requires more than a list of ingredients and a method. Generally I always try to follow instructions as closely as possible on the first attempt of a new recipe, only making changes if something is not working properly i.e. burning. Which does sometimes happen. But every cook will tweak recipes as they go and I’m no different. However this recipe is so good that I find very little adjustment is required. It is one I’d been wanting to try for a while but had never quite been brave enough to attempt – the ingredients alone fill one page of the recipe book and the process takes several hours. However it was the first dish I ever ate a fine dining restaurant (the excellent Trinity in Clapham) and has stayed with me ever since. I saw that it featured in Trinity chef Adam Byatt‘s book ‘How to Eat in’ and I managed to get hold a copy to ogle over. 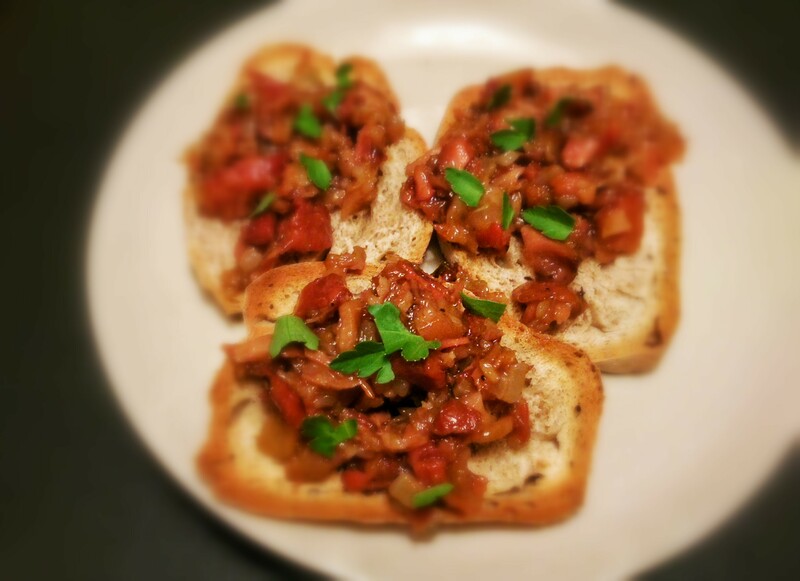 And there it was ‘Pig’s Trotters on toasted Sourdough’. Brilliant. But, as I said, complicated and time consuming. It also features a fair amount of meat and, as my wife is a vegetarian, it was never going to be something that I could present for a normal dinner at home. And it’s a starter anyway so there you go. However, as she was away for a couple of weeks and I had a good friend coming to stay – one with whom I often cook over-the-top and ambitious dishes – it seemed like a good opportunity to give it a go. And the recipe says that the cooked trotter mix can be kept refrigerated for several days (ideal for making in advance) and also frozen so allowing me to make a full batch and only use what was required for two before storing the rest. Or scoffing it myself. However, in the end I decided to do a half batch as I wasn’t sure I’d get four trotters in my casserole. As the title suggests, the main component is pig’s trotters which was not something I had ever cooked with but that never stopped me before. It also needs smoked ham hock along with stock vegetables, vinegar, and spices. I had decided to forgo the garnish of crackling – not because I dislike it but purely because as I was only cooking for two it seemed a bit excessive and crackling doesn’t exactly keep well. After ringing various butchers with no avail to enquire about the availability of trotters, I meandered into Brixton where, of course, I was soon in possession of two huge trotters and a good hunk of smoked hock. The recipe says that some trotters need to cleaned and soaked overnight to remove impurities before having any hairs removed but these were ready to go and so no fuss for me. Thankfully. The cast iron casserole was dug out and my instinct about only doing a half quantity was proved wise – the two trotters I’d bought only just fitted in. Lucky me. I carefully prepared everything – chopped vegetables, measured oil and vinegar, found the right amounts of spice – then, after re-reading the recipe again, I began. It is here I must tell you that although I said the recipe was complex, the processes involved are actually very straightforward – there are simply several of them. Vegetables and spices are browned in oil then quickly caramelised with honey, vinegar added and then reduced before the meat and stock are added. All very simple. This is where the time factor comes in. The trotters need to be simmered slowly to break down all the gelatinous tissue so the initial cooking-time is five hours with regular basting. Note that the trotters will curl up slightly (as if they are still alive) during this period – this may be slightly alarming the first time you open the lid to baste them. Well, I was alarmed. After five hours in a low oven, the casserole is removed and the mixture allowed to cool (time factor again) then the meat and skin is separated and diced, the vegetables strained and discarded, before the stock is left to chill in the fridge (again, plan you day carefully to allow for this), skimmed of fat and then reduced. Not complicated stuff – just a series of processes. I didn’t add all of the skin as the recipe suggests, opting for about two thirds as it seemed to be plenty. While the stock reduces, more onions are fried in a pan and joined by the meat and stirred together before the rich coloured stock is added and everything is reduced to the consistency of a sticky, juicy and chunky pâté. At this point, the mixture can be cooled and stored for future reheating and this is what I did. Although I had a sneak preview first of course. It was gloriously rich, almost overpoweringly so, but the finished dish features a sharp and creamy Sauce Gribiche and a fried quail’s egg to help counterbalance the richness so I wasn’t worried. The Sauce Gribiche was a recipe I’d used before so I didn’t use the same as Adam although the ingredients and flavours were the similar – hard-boiled egg, oil, vinegar, cornichons and capers, tarragon and parsley. Great with many things not just trotters. 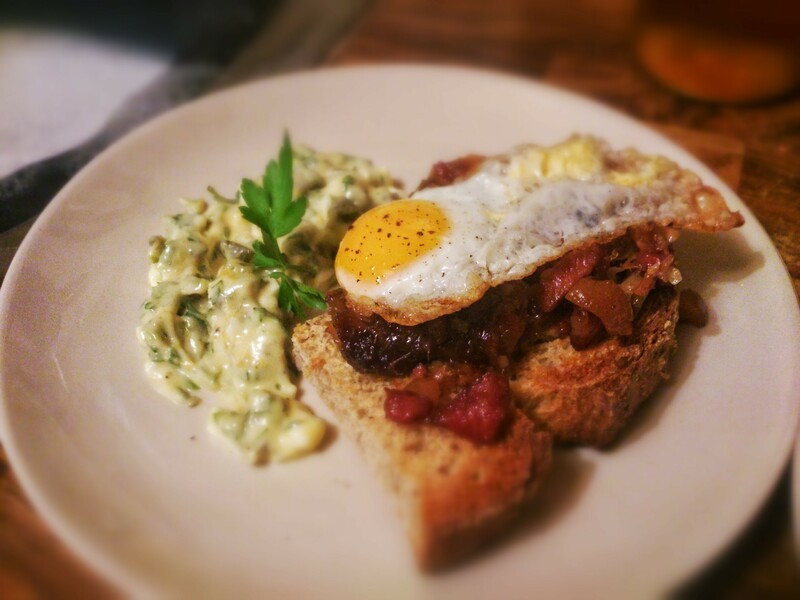 I had got some quail’s eggs from the local butcher and, once the toast (my own sourdough of course) was on, the trotters reheating, we carefully cracked them into the pan and cooked for about one and a half minutes. The dish was assembled and looked, well, pretty damned impressive I must say. Almost professional standard in my own rather humble opinion. And it tasted utterly amazing with the richness being perfectly balanced out by the Gribiche and quail’s egg. A truly wonderful starter and one of the best dishes I have ever cooked. So in conclusion, should you try this recipe out for yourself? Yes. Absolutely. Don’t be put off by the size of the ingredients list and the time involved – other things can be done while the trotters simmer and the advance preparation make it perfect if you’re planning a special dinner. Or just a greedy night in. Is it as good as the one in the restaurant? Well, that’s a matter of opinion isn’t it? If you want to try it, here is the version that I used – it makes enough as a starter for 4-6 people. Preheat your oven to Gas Mark 3/170⁰c. Peel and roughly chop the carrots, garlic cloves, and one of the onions. Trim and roughly chop the celery and leek. Peel and finely dice the remaining onion and keep separate (to add to the cooked trotter mix later). Heat half the oil in a large cast iron casserole and colour the roughly chopped vegetables with the spices over a high heat. Onceed brown, stir in the honey and boil for a few minutes and caramelise lightly, then add the vinegar and boil for a further 2 minutes until reduced by half. Remove the casserole from the oven and leave to cool, then lift out the trotters and ham hock and set aside. Tip the contents of the pan into a fine sieve set over a bowl and let the stock strain through. Chill the stock in the fridge so that the fat rises and sets on the top. 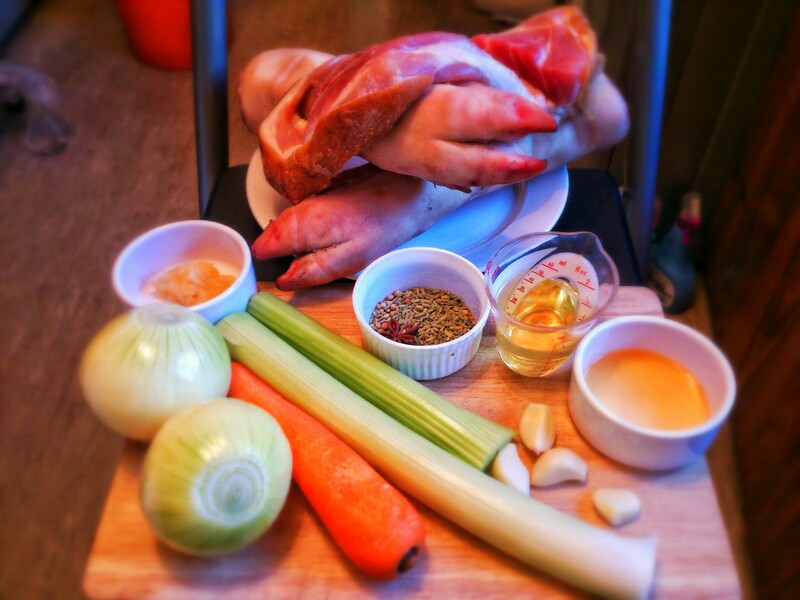 Carefully remove the meat and skin from the trotters, then dice both the meat and skin and place in a bowl. Separate the meat from the skin and bones of the hock. Dice the meat and add to the bowl. While you wait for the stock to chill you can make the Sauce Gribiche (or whenever you need it to serve) by placing the egg in a pan of boiling water and simmering for 7-10 mins until hard boiled. Remove and run under cold water until cool then peel the egg and separate the white from the yolk (which should be a solid ball), reserving the white for later. Mash the yolk with the mustard in a bowl until you have a smooth paste. Slowly dribble in the oil (as if making mayonnaise) and mix the paste – it will look like it has split or turned into a horrific mess at first but keep mixing until it turns into a smooth, silky mixture. Chop the egg white into small cubes and stir in to the yolk-mix, along with the chopped capers and cornichons, then finally add the chopped herbs. Taste and adjust the seasoning if necessary and keep refrigerated until required. Skim the fat off the chilled stock, then transfer the stock to a pan and reduce by half over a high heat. Meanwhile, heat the remaining oil in a frying pan until hot and fry the diced onions until caramelised. Mix with the diced meats, and stir in the reduced sauce. Season and keep warm until ready to serve – or cool and store in an air-tight container in the fridge for up to 10 days. Toast some sourdough bread and carefully fry the quail’s eggs for no more than one and a half minutes (any longer and you won’t get a runny yolk) then assemble your dish by spooning a generous amount of the trotter mix onto the toast, top with the fried egg and garnish with a dollop of Sauce Gribiche and a scattering of parsley. Feel very pleased with yourself. I’d like to thank Adam for not only creating this brilliant recipe but also giving me encouragement via Twitter as I made it! One of the things I love the most about real BBQ is the deep richness that comes from slow, low cooking in a smoker. Sadly, as I live in a first floor flat without any kind of outdoor space (apart from a windowsill and that is hardly going to accommodate a big fat Weber), I have been unable to indulge in such antics. However, I have been toying around with the idea of using my stove-top smoker to infuse the meat and then my conventional oven to finish the cooking and I have to say I think I’ve come up trumps. When you use a proper cold-smoker you need to keep a tray of water near the meat to help keep it moist and control the temperature of the smoke – otherwise you’ll end up some charred, dry unpleasantness that will make you sad. Now, I know that you can put metal hot-smokers in the oven but I didn’t want to go down that road for a two-hour cooking session as there is nowhere to put a tray of water that would benefit the process. Nor did I want my oven to smell like a bonfire for the next few weeks (smoky cake anyone?) so I decided to use the hot-smoker on the hob and then transfer the meat to a baking dish and put liquid in that before covering the whole lot and cooking at a low temperature for a good couple of hours. Simple. I used a rub based on the excellent Pitt Cue Co recipe – I would have followed it exactly but didn’t have all the ingredients – and let the meat sit overnight before smoking. After finishing in the oven I have to say the results were fantastic! Although there wasn’t exactly the smoke ring through the meat that is the sign of proper BBQ, there was a bit of char and a good ‘bark’ (if you eat enough BBQ you’ll know what I mean) and, above all, there was a glorious smoky flavour that ran through the whole thing. It was quite staggeringly good. I’m going to make it again. Probably rather soon. So, here we go…. Note that the following quantity makes a large amount of rub but it keeps really well in a sealed container for a few weeks. Also, make sure you remove the thin membrane on the ribs – if you turn them so the curved side is down, use a sharp knife to carefully separate the membrane from the meat and then pull the whole thing off. It may or may not come off in one go. And yes, it is alarmingly satisfying. First, make the rub. In a dry pan lightly toast the fennel, cumin, pepper, and coriander until they begin to smell amazing then remove and allow to cool. Blitz with the rest of the spices in a spice grinder or pestle and mortar. Next, prepare the ribs. It is worth making sure they will fit easily in your smoker – you may find you have to cut the rack into portions but that won’t matter. Having removed the membrane from the rack, rub the whole lot generously with your, er, rub, cover, and put in the fridge overnight. If you have space put the ribs on a wire rack to let any liquid drip out but it’s not a disaster if your fridge is too mini. The following day, remove the ribs from the fridge and pat them dry with some kitchen paper and allow to come back up to room temperature. Prepare your smoker – I used oak chippings but any decent strong flavour will do – put the meat on the rack in the drip tray over a handful of chippings, put the lid on and place over a high heat until it begins to smoulder and then turn your hob down low. Cook the ribs for 30 mins then remove from the smoker. While your kitchen is slowly turning into a smoky den (make sure you have all your windows open!!! ), put a small wire rack in a roasting tray and add your liquids to the bottom. Pre-heat your oven to Gas mark 2/150c. When your ribs are smoked, put them on the rack and cover the tray with foil then put in the oven for at least two hours, checking occasionally and adding more liquid if necessary. After waiting patiently and smelling the increasingly awesome aroma that will be filling your kitchen, remove the tray and have a look at the meat – the outside will flake away and the meat should be tender and easily come away from the bone. Glaze with BBQ sauce and finish under a hot grill to add an extra layer of gloss and decadence. Eat without delay with pickles and any other BBQ delights you may have. 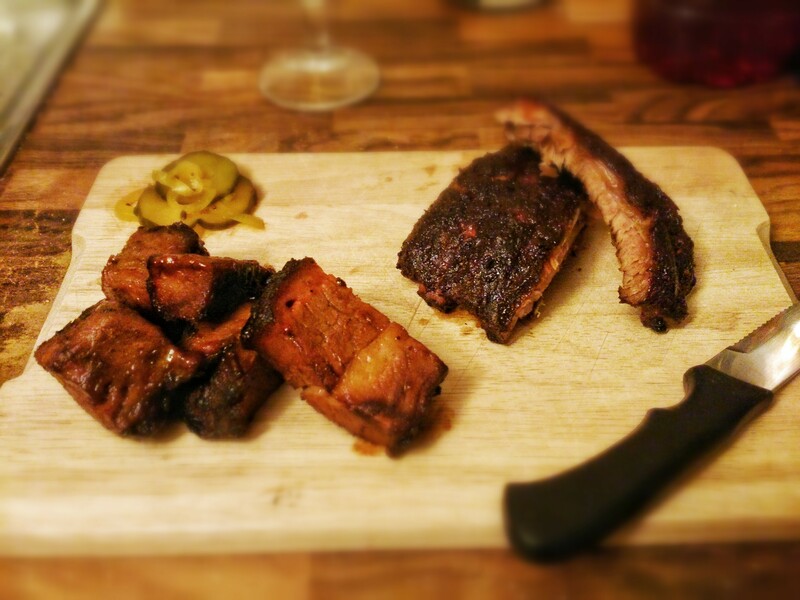 I found some burnt ends kicking about so I had them too….